Do you want to fight your DUI? Do you know if the machinery used in your DUI was working properly? Many times, it's not and that's why you should fight back. We believe in helping people fight back against the system for any ticket they receive, including DUI. We're here to help. 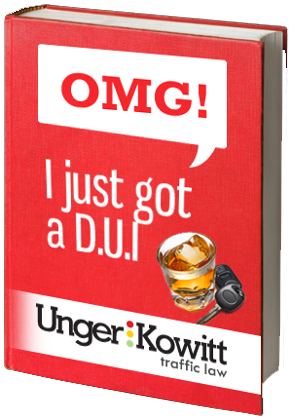 Your first step should be to contact a Florida DUI lawyer.The DUI attorneys at Unger & Kowitt (we even have one who is a former prosecutor with the State Attorney's office) have been defending people with DUI’s since 1995. Put that experience to work for you. Did you get a DUI? A DUI is a serious matter that could cost you thousands of dollars in Bonds, legal fees, fines, and DMV/ Reinstatement fews, just to name a few! Download our eBook to learn how you can FIGHT BACK. Just CLICK HERE and you're on your way to having your license cleared.